In the past few years, we’ve become enamored with Indian food. Warm, wrap-you-up-in-a-hug type food. The kind that perfumes the whole house with its scent of cumin, coriander, garam masala, and ginger. The kind that envelops your spoon and soothes your soul. We’ve made this crock pot chicken tikka masala more times that I can count and have moved on to curries, vegetarian masala, and most recently, butter chicken (stay tuned next week!). And with all of those meals, just like with a saucy Italian meal, I’ve always felt like some kind of bread was needed to sop up the goodness that the rice wouldn’t absorb. 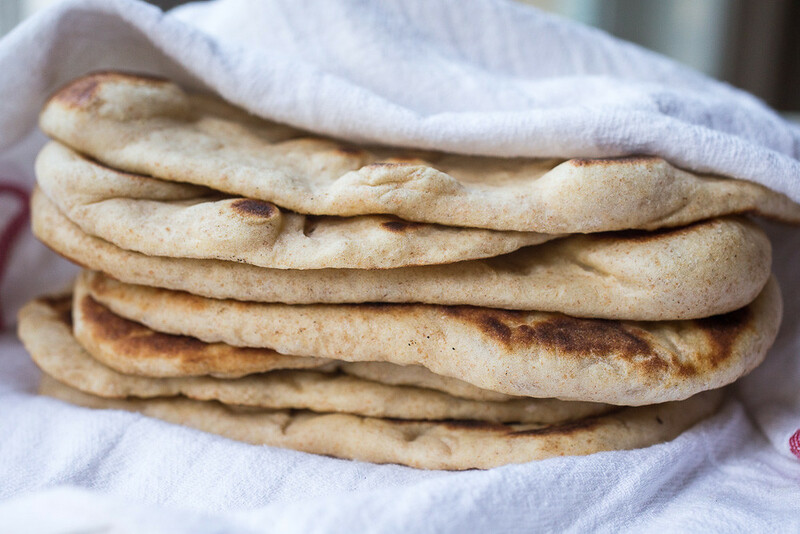 Enter this easy homemade naan. Sure, I could have easily picked up a package of naan at the grocery store but you know me: I’m about the challenge. 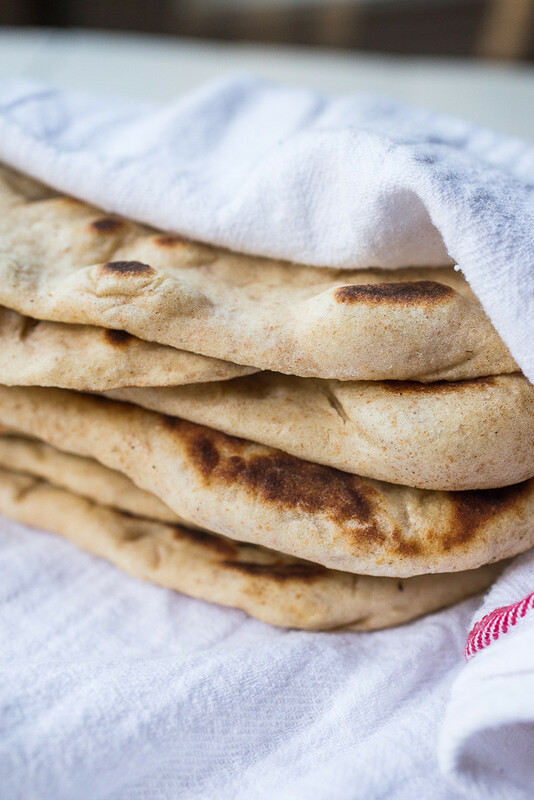 Actually, I can’t really say this naan was much of a challenge because with just a few basic pantry ingredients, the dough almost came together by itself. Rolled out, brushed with melted butter, and cooked in a searing skillet, this was definitely one of the easier and quicker yeast dough recipes I’ve made recently. 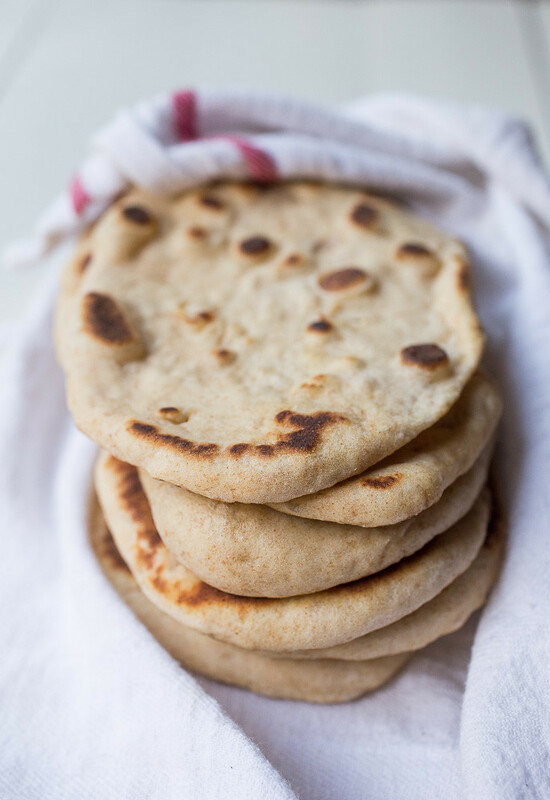 Torn into pliable, scoopable pieces, this soft Indian flatbread was pretty much the best I could have asked for to soak up all of my favorite new sauces. Leftovers keep well for a day or two in the fridge, and because this recipe yields 16 servings, you can freeze a whole bunch of dough balls to use on other nights. That’s precisely what I did a few weekends ago and as you can see in the photos below, the dough thaws, rolls out, and cooks beautifully. I hope the how to photos I took this past weekend are as helpful to you as I always find them to be for new recipes I try. The full and print-friendly recipe is below the tutorial. Please be sure to come back and let me know how this easy homemade naan turns out for you – I love to hear from you guys! divide the dough into 16 equal pieces and shape each piece into balls on an unfloured surface, placing each ball on a well-floured work surface. cover the extra dough as you work to prevent a skin from forming or freeze the shaped dough on a parchment lined baking sheet then transfer to a zip-top bag. the dough will be a little sticky so be sure to have extra flour on hand. roll out two dough balls into long ovals, about 6 to 8 inches each. lay the rolled-out dough butter-side down in a really hot 12-inch cast iron skillet. immediately brush the tops with more butter. while these cook, quickly roll out the next two dough balls. 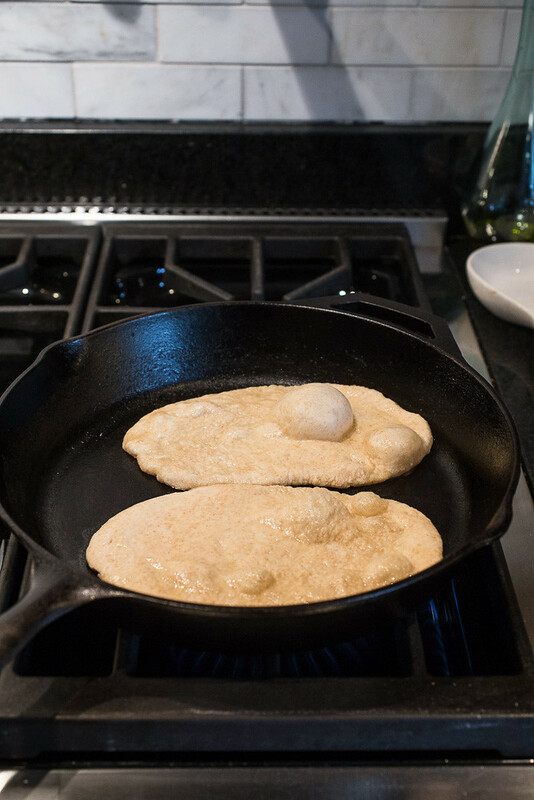 cook the naan for about two minutes, until bubbles form on the top of the dough and the bottoms are splotchy brown. flip and cook for another 1-2 minutes until the naan is browned in spots. remove the naan from the pan and repeat with the next two pieces of rolled out and buttered dough. keep the finished naan wrapped in a clean kitchen towel until you’re ready to serve. Mix the yeast, water, and sugar together in a medium bowl and allow it to sit for 10 minutes (for active dry yeast) or 5 minutes (for instant yeast) until foamy. In a large bowl, whisk the flours, baking soda, baking powder, and salt together. Stir the milk and yogurt into the yeast mixture. Make a well in the center of the dry ingredients and pour the wet ingredients into the well. Using a wooden spoon, stir everything together until a shaggy dough forms. Transfer the dough to a well-floured work surface and knead until it comes together; it will still be a little sticky but should hold its shape well. Wipe out the original bowl and then lightly grease the bottom and sides. 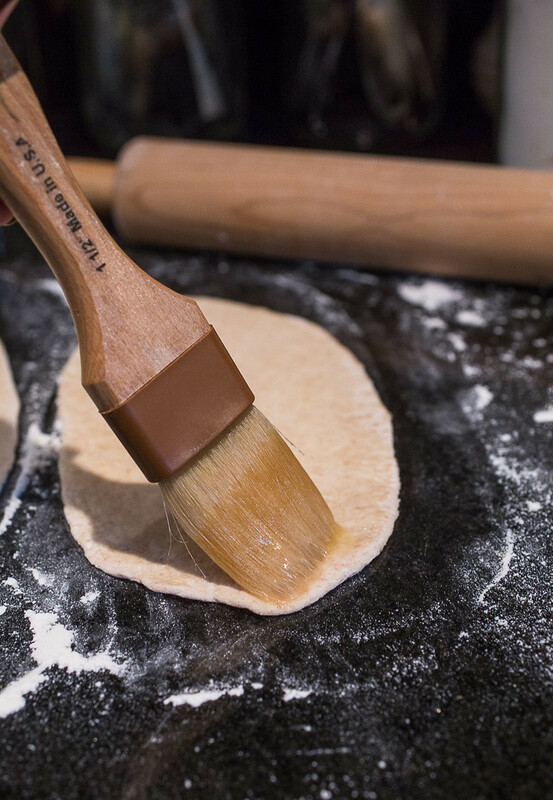 Transfer the dough back to the bowl and roll it around to coat with the grease. Cover the dough with a clean kitchen towel or some plastic wrap and allow it to rise in a warm spot for about 1 hour or until it doubles in size. 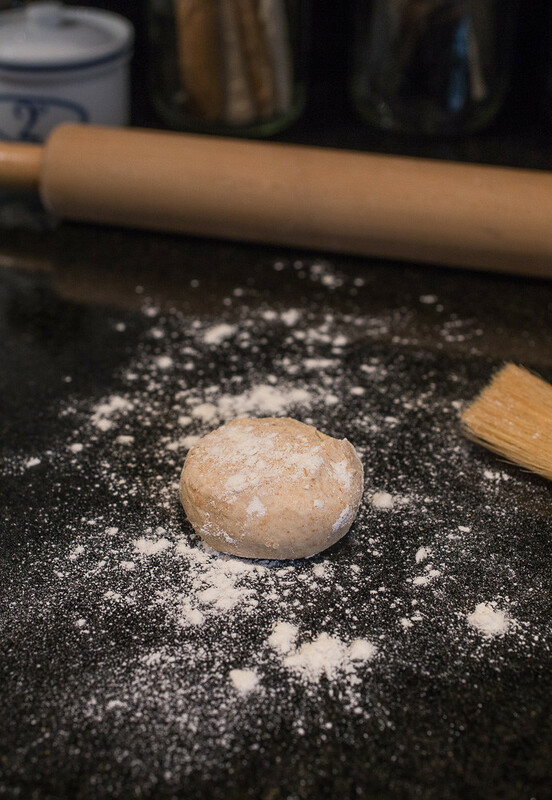 Divide the dough into 16 equal pieces and shape each piece into balls on an unfloured surface, placing the finished balls on a well-floured work surface. 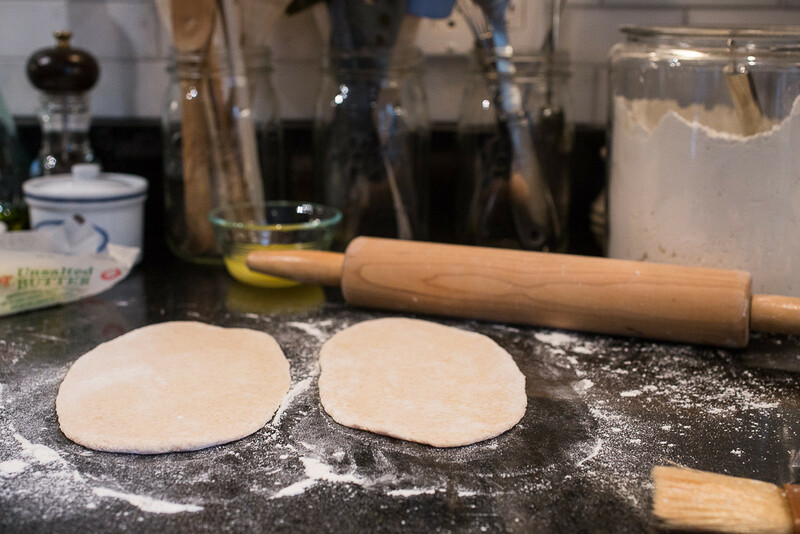 Cover the extra dough as you work to prevent a skin from forming. The dough will be a little sticky so be sure to have extra flour on hand. At this point, you can freeze the shaped dough on a parchment lined baking sheet then transfer the frozen balls to a zip-top bag. Allow the dough to thaw at room temperature for about 2 hours. When soft and thawed, proceed with the remaining instructions. Roll out two dough balls into long ovals, about 6 to 8 inches each. Brush the tops of each with melted butter. 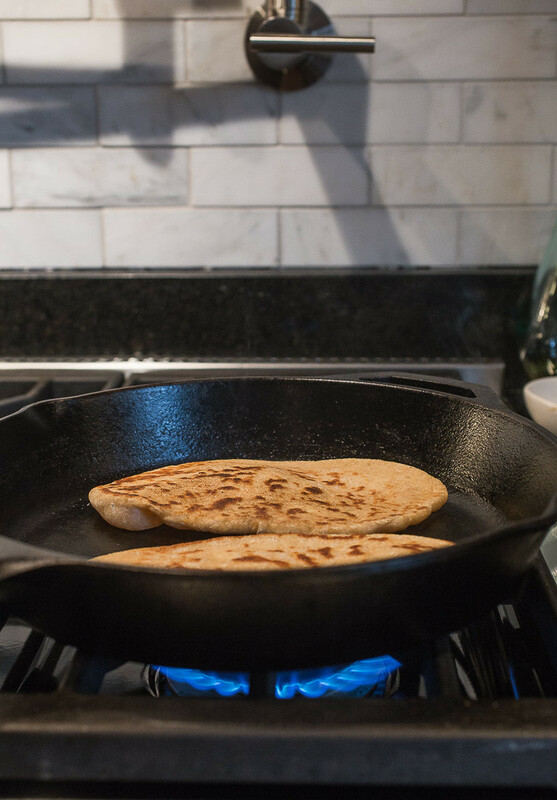 Lay the rolled-out dough butter-side down in a really hot 12-inch cast iron skillet. Immediately brush the tops with more butter. While these cook, quickly roll out the next two dough balls. Cook the naan for about 2 minutes, until bubbles form on the top of the dough and the bottoms are splotchy brown. Flip and cook for another 1-2 minutes until the naan is browned in spots. Remove the naan from the pan and repeat with the remaining pieces of rolled out and buttered dough. Keep the finished naan wrapped in a clean kitchen towel until you're ready to serve. Reheat the naan if necessary wrapped in foil in a 300° F oven until warmed through, about 10 or 15 minutes. Store in the fridge in a zip-top bag for up to 2 days. *Note: The original recipe calls for plain yogurt but if all you have on hand is Greek yogurt, stir in enough water to bring the Greek yogurt to the loose consistency of plain yogurt. Non-fat, low-fat, or full fat yogurt will all work fine in this recipe. Stir the milk and yogurt* into the yeast mixture. Make a well in the center of the dry ingredients and pour the wet ingredients into the well. Flip and cook for another 1-2 minutes until the naan is browned in spots. Remove the naan from the pan and repeat with the remaining pieces of rolled out and buttered dough. Keep the finished naan wrapped in a clean kitchen towel until you’re ready to serve. Reheat the naan if necessary wrapped in foil in a 300° F oven until warmed through, about 10 or 15 minutes. Store in the fridge in a zip-top bag for up to 2 days. I’ve always wanted to make my own naan! Your recipe sounds so good!! I couldn’t believe how easy it was to make and I’m fairly positive that you’ll love it! Yes! I recently declared Friday nights my homemade indian night. I usually prefer garlic naan when I go out for Indian. So I’m definitely going to try to adapt this recipe to garlic naan this friday! Thanks! More indian please!! Excellent idea! The link to Food52 has some suggestions for add-ins like garlic – I’m sure that would be outstanding! !